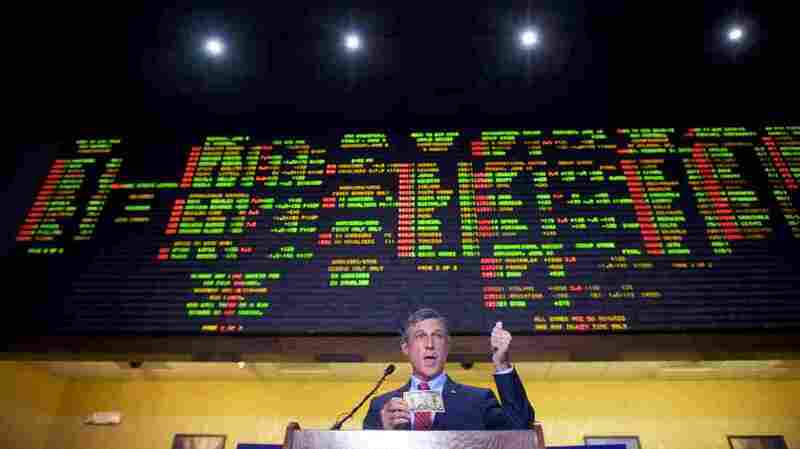 Delaware Legalizes Sports Gambling, And Governor Makes First Bet After a U.S. Supreme Court ruling that the federal government cannot stop states from legalizing sports betting, Delaware didn't waste any time taking advantage of the opportunity. Delaware Gov. John Carney holds a $10 bill he used to place the first bet at Dover Downs Casino on Tuesday in Dover, Del. Delaware is the first state to launch legal sports betting since a Supreme Court decision allowed states to legalize such gambling. While a number of states were poised to take advantage of the change in the law, Delaware was the first across the finish line. That makes Delaware the second state with fully legal sports gambling, following Nevada, which had legalized the practice before the federal law was passed in 1992. Mark Eichmann of member station WHYY reports that casinos in Delaware aren't anticipating a massive windfall as a result of the shift — especially as other states, most notably New Jersey, move to follow suit. But local gamblers are pleased that they don't have to turn to online betting, or travel to Las Vegas, to place their bets, WHYY's Zoë Read says. "State officials expect the launch to make a significant contribution to tourism in Delaware — where 17 percent of visitors participate in gambling.
" 'Tourism is a big thing in our state, particularly as we move into the summer season ...' Carney said. 'Today we're going to be first in offering them an entertainment opportunity so they can support their sports teams ... by making a legal wager.' "
If you or a loved one have a gambling problem, consider calling the National Council on Problem Gambling's hotline.